Sarah Winkler was born in Manchester, England, and currently lives and works in Morrison, Colorado. Winkler studied Art and Earth Science at William Paterson University and combines both subjects in her landscape and environmental artworks. Winkler is best known for her desert and mountain geological interpretations of the American West. Her art practice involves the direct experience of walking into and documenting the landscape with observational drawing and photography. Geological research of specific areas assists in the visual and thematic choices that create each body of work. Winkler works experimentally with materials and tools to find textures and imagery that mimic the forces and patterns of nature that sculpt and change landscapes over time. The cut and layered aesthetic in her work reinforces concepts that the Earth is not a static place. That ancient landscapes can be altered through gentle erosion or by sudden cataclysmic events. She incorporates actual ground water, crushed rock and mineral from the landscape in her paintings to create moments of connection, exploration and discovery. Winkler has exhibited nationally since 2004 and was recently showcased at the LA Art Fair and Art Aspen in 2018 coinciding with a major solo show Luminous Mountainous in Denver at K Contemporary. Her works have been placed by galleries and art advisors in many prominent private and corporate collections including including Albemarle Chemicals, Chevron, The Phoenician, Mountain Shadows Resort, Hilton, Hyatt, Marriott, The Cosmopolitan Hotel of Las Vegas, Viceroy, Ritz Carlton, Montage, Empire Pass, Deer Valley Resort. In 2019, Winkler was honored to be selected by US Ambassador, John Pommersheim and the curators of the highly regarded Art in Embassies program to participate in an upcoming 3 year cultural visual diplomacy exhibition at the US Ambassador’s residence in Dushanbe, Tajikistan, sister city to Boulder, Colorado. Her works championing the Natural Monuments of Colorado, have also been invited by Gov. Jared Polis to show at the Governors Mansion in Denver, Colorado. Her exhibitions are receiving critical review from M. Paglia for Westword, R. Rinaldi for Denver Post, C. Anderson for 303 Magazine, and have been featured in Radical Art Review, Scientific American, Dwell, Luxe, Alpine Modern, Mountain Living, CREATE! and New American Paintings. Winkler’s first environmental show, The Saga of the Reef, was at Thoreau Center for Sustainability in San Francisco where the artist created relief paintings that interpreted the cycle of a diminishing coral reef habitat. Her second was Solar Harvest, a 12 x 432” linear painting about capturing the Sun’s energy over a 24-hour period to power the grid. She is currently working towards her third environmental solo exhibition of multi media work, Smoke Signals. This work reveals how massive wildfires are reshaping the last wild landscapes of the West. The exhibit, with K Contemporary in Denver, will open April 2020 to coincide with the 50th Anniversary of Earth Day. 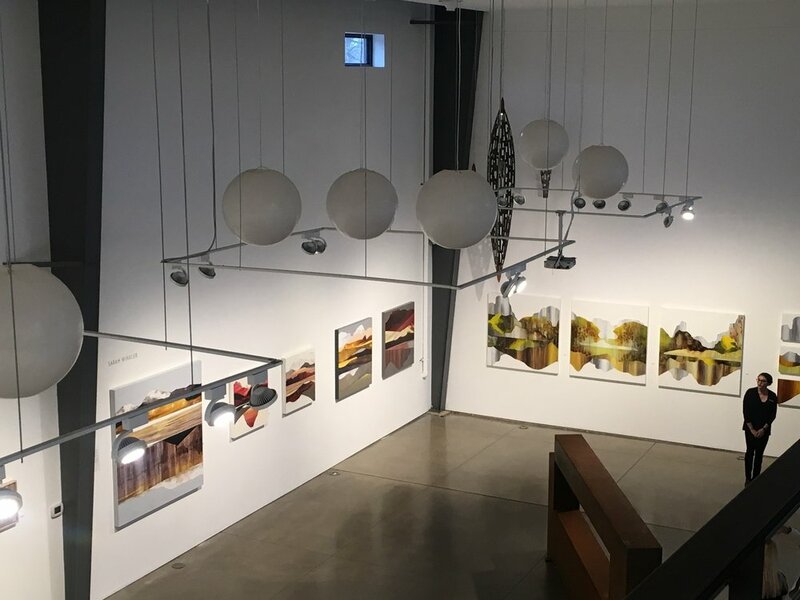 “Luminous Mountainous” Solo Exhibition 2018 at K Contemporary, Denver, CO.
“Luminous Mountainous” Solo Exhibition 2018. ©2019 Sarah Winkler. All Rights Reserved.